Come and discover my new Reindeer Centre. My Reindeer in their spare time like to play around in the snow and entertain themselves with some fun activities. There are lots of activities to keep you busy at my Reindeer Centre, just like my reindeer in their leisure time. 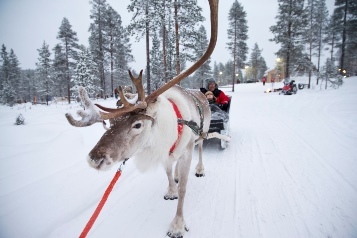 Here you enjoy your traditional reindeer sleigh ride guided by my Sami friends. Make sure you bring your throwing arm as you will have the opportunity to show your lasso skills, a traditional method of gathering reindeer that is still used by the Sami reindeer herders today. 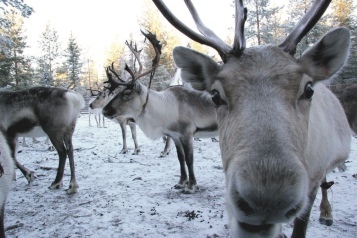 At my Reindeer Centre you even get the chance to feed my reindeer some of their very special and favourite treats. 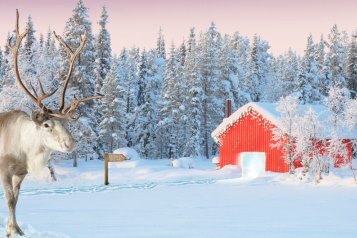 If you whisper the secret magic words they will then point you in the direction of my special barn, where some jolly friends of mine will share certain reindeer secrets and have a few laughs and jokes with you at the same time. You also have the chance to have a go at Crazy Reindeer Golf, a fun game created by my very own crazy reindeer Comet and Vixen. Imagine trying to to play golf on ice and snow around the obstacles. Tell me if you get a 'hole in one'! This is great fun for all the family, especially for the children as they often show up the adults. I'm looking forward to you visiting my beautiful centre, I just love watching the children and adults having fun with all the activities that there are to do. You will have as much fun here as my reindeer do in their spare time.